In this workshop we will explore the relationship between children’s early artistic expressions and educators’ connected listening as a way to assure equity in our learning spaces. We will reflect on how to promote agency, autonomy and participation by providing an array of process art materials that expand each child’s tool box and repertoire for self-expression. We will look at how our active listening and recording of children’s stories can scaffold our own learning, guide how we plan our environment and amplify the youngest of voices by sharing these stories with our communities through documentation. In this session attendees will participate in an interactive session to open up a discussion about substance addiction in their communities. Improbable Players will use storytelling techniques based in social justice community practice to facilitate this conversation. Using role play, scenic elements, and personal stories, attendees will learn the 7 rules of engaging a potential substance addict in a helpful and healing conversation. Attendees will also be introduced to best practices in having these conversations with students. Let’s have a conversation about how teachers can Indigenize the classroom! Indigenous humans and history are largely erased in the Boston area and in the classroom. Most students cannot even name whose territory they are on, and often are not aware that Indigenous peoples and cultures still exist. Meanwhile, Columbus Day continues to be widely celebrated. How can educators ensure that Indigenous history and perspectives are included throughout the curriculum -- and not just in discussions of Indigenous Peoples Day or Pilgrims/Thanksgiving? These are tasks intrinsic to decolonizing classrooms and countering white supremacy. I advise a student-led racial justice club for my 5th/6th grade students. Last year, the students chose to learn about their own racial identity developments, share their stories through spoken word, and then lead their own classmates in workshops about reflecting on racial identity and how that affects our classroom and school. I would like to share these students' stories and work with other teachers to foster dialogue and perhaps help others create similar projects with their youth. If the scheduling works out, I'd be more than happy to invite some or all of my youth to be a part of this session. How do you construct your identity in a society that has amnesia and predicates in reminding you and others like you are the reason for societal problems. This workshop will take you on a journey that will make you identify, clarify and re-direct your views on immigration, education, justice an social justice. The journey will utilize Mr. Alfonso Herrera's narrative. Alfonso Herrera was born in Mexico and immigrated to the USA in 1969. He will give a compelling story on the intersectionality of race, education and immigration status. Mr. Herrera has a BA in Chemistry from the University of Dallas and an Ed.M. In Prevention Science and Practice from Harvard Graduate School of Education. He is the former Director of the City of Dallas Gang Prevention Intervention Program. He is a dynamic professional speaker. Mr. Herrera has served school districts, juvenile justice departments, cities and is Internationally recognized in the field of Juvenile Justice. 50 years ago, the day following Dr. Martin Luther King’s assassination, James Brown followed through on performing a scheduled concert in Boston that many believed saved the city from violent protests like those seen across the U.S. James Brown, along with Nina Simone, the Impressions and more, frequently sang of the honest struggle of living amid racial inequality and t​he social impact of their work is beyond measure. In the decades since the Civil Rights Movement, songs highlighting racial injustices have diminished in commercial appeal, especially in the “post-racial” era of the past decade, which has led to increased access barriers to conscious music for youth and adults alike. This workshop will be led by School of Education Professor Bruce Campbell, Jr. Ph.D, and Graduate Assistant Mr. John Stuetz from Arcadia University. Dr. Campbell, who is also known as “DJ Junior,” owns Record Breakin’ Music Label based in Philadelphia. The goal of this workshop is to facilitate a dialogue on how we, as educators, students and aspiring musicians alike, can increase our historical understanding and consciousness by rediscovering social justice-oriented records of the past, as well as be empowered by the lesser-heard liberation records of the present. Dr. Bruce Campbell Jr., Associate Professor, Arcadia University. Mr. John Stuetz, Graduate Assistant, Arcadia University. Water in the Middle East has long been talked about as a precious resource; many believe scarcity is the most pressing issue. In fact, the Mountain Aquifer lies directly under the West Bank and is water resource rich. So why, then, do people living in the West Bank suffer from exhaustive drought in both the summer and winter? Why do they pay for bottled water when such a vast water source exists just below their feet? In this session, Water for One People Only, teacher educators will be presented a lesson plan, created for middle and high school grades, to assist them in outlining the historical trends that have led to the seizure of Palestinian resources for sale. Utilizing role-play, teacher educators will be equipped to portray the comparative use of water resources by the state, private companies and settlers living in the West Bank. Social movements have always been at the center of political activism and social change. Youth have been characterized as the backbone of the civil rights, feminist, antiwar, and queer liberation movements. This workshop will explore the youth leaders (past and present) and young people’s role in youth movements and discuss what are the needs of building up the leadership and capacity for young people’s leadership and change with the Youth Justice & Power Union (Boston). Restorative Justice, an approach rooted in Indigenous traditions, strives to transform school culture by creating space to reclaim voice and connection while also shifting the current school discipline paradigm. Restorative practices help us remember to be in good connection with each other and how to make things right when harm is done. They offer support to all students, including those who have experienced trauma, and create a space that enables healing within the school community. Circles are a foundational restorative practice that can be used to build connection and community as well as to explore important topics and decisions together. In this session, we will experience and reflect on circle practice together as an introduction to restorative justice. Using theatre, human-centered design, and the creative genius of those around us, this workshop is an exploratory dive into the systems we encounter every day and how to reimagine those relationships to be more beneficial to the world we seek to create. Facilitated by Via Arts LLC Founding Partner, Kristianna Smith, this session offers young leaders a framework to use to when building a collective vision of the future fueled by the ideas voices and ideas of the community. After fifteen years of restrictive English-only legislation, Massachusetts legislators finally opened the doors again to bilingual education. But what will this mean on the ground? What does educational and linguistic justice look like for emergent bilingual children (typically referred to as ELLs)? This session will include a panel of speakers who have been committed to bilingual and multilingual justice in the Greater Boston area. Each panelist will speak briefly, then all participants will engage in dialogue an action-planning process aimed at identifying concrete steps that parents, youth organizers, teacher advocates, and others can take to influence policies and programs during this important transition in our state. Stories from marginalized youth can hold immense power when their voices become unified and heard. Our classrooms are centers of conversations, self-reflection, social justice progression, and education that incorporate life experiences with a youth view of society. Youth of color are plagued with systemic racism and oppression that impact their future. Empowering these youth ultimately benefits them, our communities, and our society. YouthWOKE exemplifies what can happen when youth share experiences and come together to address the struggle for self-determination. This group was started by Community Call Leadership students and is sponsored and overseen by Community Call. It is a fully student-centered program with their own agenda and youth leaders but they are a Community Call program. 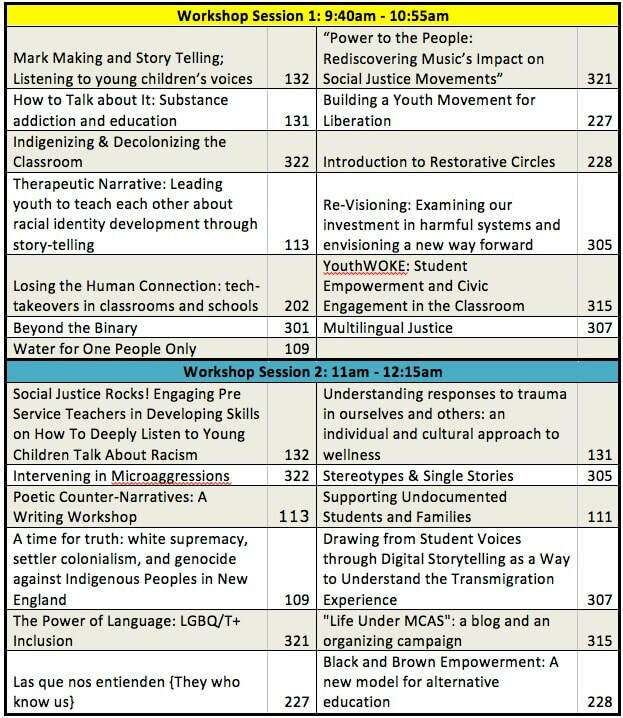 This session will explore the idea of what young children bring to the conversation around issues of racism and how a particular environment of culturally sustaining pedagogy can support anti racist curriculum. Microagressions are happening in our community. We are hoping to build a more inclusive school environment. We will discuss the definition and origin or microaggressions. We will also address what to do to interrupt microaggressions. In this workshop, young people will read and write poems that are counter-narratives. Participants will engage in reading several poems that speak back to a dominant and/or oppressive narrative, and analyzing the structure and form of these works. Using these poems as a foundation, participants will then draft their own counter-narrative poems. Together, the group will build a larger tableau of their poetic drafts and reflect together. The first half of our workshops space will entail a presentation from student leaders on the work they have been doing and what they achieved. This will take the form of a power point presentation that details the current Ethnic Studies class curriculum, how students achieved their success, and what are the challenges we are currently facing to reaching their goals. The second half of the workshop will consist of breakout groups in which participants will brainstorm and collaborate with student leaders by addressing their challenges. The goal is to give student leaders a different take on their own struggles and also connect them to a larger community working towards Ethnic Studies. These break out groups will specifically address challenges student leaders face. Currently our challenges are: no teachers of color are teaching the class, community engagement is limited, Only half of the high schools have Ethnic Studies courses even though the central office supports the effort, etc. Admittedly these challenges may be different by the time March arrives so the workshop will change to reflect that. The session is an introduction to LGBQ/T+ definitions, will include media and stories of youth experiences, and strategies & practices around incorporating more inclusive language into participant’s work and lives. How do Indigenous communities in New England heal from centuries of land dispossession, dehumanization, genocide, and institutionalized racism? How do these communities deal with repeated efforts to relegate them to remote history and deny that they still exist here? We will screen a 13-minute documentary film, First Light, about the Truth and Reconciliation Commission in Maine between the Wabanaki People and the state’s child welfare agency created to address the decades-long practice of forced removal and coerced assimilation of Native children. The short film contains powerful testimony from Native adults who were taken from their families as children. After viewing we will begin a conversation about how to use primary sources to teach rich historical content while promoting both critical and creative thinking. We are especially interested in promoting self-awareness and social awareness so more students understand structural racism and choose to become upstanders. By teaching disturbing chapters of our regional history we can have meaningful conversations about genocide, identity, coercion, historical trauma, and resilience, and also improve relationships in our classrooms and schools. Ultimately the thoughtful use of social issue films and egalitarian discussion techniques can help cultivate anti-bias awareness and proficiency, embed social emotional learning in content-rich lessons, and encourage an unwavering commitment to justice. Many students and some teachers don’t know that Maine was a province of Massachusetts until 1820 and that our histories are deeply intertwined. Dr. Mishy Lesser, learning director, Upstander Project and Adam Mazo, director, Upstander Project are the session leaders. This session is the result of 4 years of collaboration with Wabanaki community leaders -- mostly women -- who were the catalysts behind the Maine Wabanaki-State Child Welfare Truth and Reconciliation Commission. The film, First Light, introduces viewers to their story and was gifted to the TRC and its founding organization, REACH, at the conclusion of the TRC's mandate. To counter oppression we face in schools and activist groups interlaced with the barriers to liberation, joy, and well-being experienced by those we work with, we need to collectively understand and strategize about how to deal with the variety of human responses to witnessing trauma in others. This workshop will introduce three different frameworks to systemic and individual healing and wellness practices specific to secondary exposure to trauma, including bearing witness as students, other educators, and wider cultures exhibit responses to challenges they face. Through popular education pedagogy, participants will interrogate frameworks, apply to their settings, and share practical solutions that can shift their individual responses to trauma around them and influence organizational practices. Run by international female high school students, this session gives an overview of the International Women United Club and topics identified by participants, and then guide educators through ways to empower female voices in the school building. This session is run by high school females of color and college students who have examined female issues through Latina Race Theory and Youth Action Participatory Research and have themselves experienced identity and resistance to amplify new female voices. Students will present a project of identity that involves their mothers and themselves; and how this knowledge improves our schools and communities to be supportive and inclusive of an immigrant population. Undocumented students face significant socio-emotional, financial, logistical, and legal challenges to their success and well-being in schools. Through this workshop, the Unafraid Educators, a BTU immigrants rights organizing committee, aims to empower people working in schools as advocates for undocumented students and families. We want to connect fellow educators to each other and to resources and information so that we can build sanctuary schools from the ground up. Through an integrated approach, utilizing articles, video clips, and dialogues, I seek to make educators think about the potential consequences of stereotyping and painting single stories within the classroom. For instance, what is the effect of the stereotype that Asians are good at math on the minds of young Asian students? What is the impact on an African-American child if an educator assumes the student comes from a single-parent household? Such stereotypes and single story lenses, although well-intentioned, can strip students of their individuality. Thus, this workshops aims to dispel the notion of positive stereotypes and outline the dangers of a single story, urging educators to see each individual student as exactly that: an individual with unique circumstances, experiences, and stories. Participants will become familiar with how and why creating digital stories with ELLs allows teachers to hone students’ voices. This presentation gives step-by-step guidance in bringing this culturally competent, instructional strategy into one’s classroom. Digital stories can be used in any content and with a range of linguistic abilities. Citizens for Public Schools has just started a blog to collect stories from teachers, parents, and students about the harm that high-stakes testing does to children. Any story that fits that description is welcome, but our particular focus is teachers describing how legally-required services for children with special needs and children who are learning English simply don't happen during testing season because the teachers who provide those services are used to administer tests. This is part of a larger campaign to expose the harm to children from high-stakes testing. The stories on the blog can be used in letters to the editor, presentations to school committees, and op-ed pieces. We are asking parents of children with special needs to ask their principals and school committees to guarantee that the special services specified in their children's Individual Education Plans will not be interrupted. Through our workshop, youth activists from an alternative education program will provide an insight into an alternative education program that imbues students with critical consciousness and shifts student trajectories through an emphasis on community building, with a focus placed on centering Black and Brown cultures and histories. Knowing our history, as well as the ways that different systems work to disenfranchise our communities, changes the way we understand our roles in the future, allowing for an empowered version of self. This program is a community-based support system that helps students who have been failing in traditional schooling. We will highlight and teach key elements of our program model that are effective in building community, such as “Harambee” and restorative circles. The concept of “Harambee” is a a Swahili concept that means “all pull together”. In addition, through small group discussions, we will examine the importance of centering Black and Brown communities in High School curriculum, understanding the ways that this can shift student success. Our hopes would be that some of the elements that we find most effective in building success for Black and Brown youth could be extended to other educational communities.